Sunburst® Gourmet Natural Treats for birds are an assortment of fun, healthy, natural snack mixes that supplement your pet’s regular diet. Available in flavors for all sizes of birds. Higgins Worldly Cuisines® are the all natural bird food appetizers that you cook up for your pet bird! Just add water to the pouch, place in your microwave oven, and in a few minutes you’re done. Your pet will enjoy the different textures and variety that Worldly Cuisines® adds to its dietary routine. Available in six flavors inspired by different regions of the world: based in long-grain rice, quinoa and couscous. You can even store the unused portion in your fridge for up to five days for multiple feedings. Sunburst® Freeze Dried Fruit are an assortment of all natural, whole-food, fun treats that companion birds enjoy. These healthy treats are free of added sugars, sulfites, preservatives, gluten and GMOs. 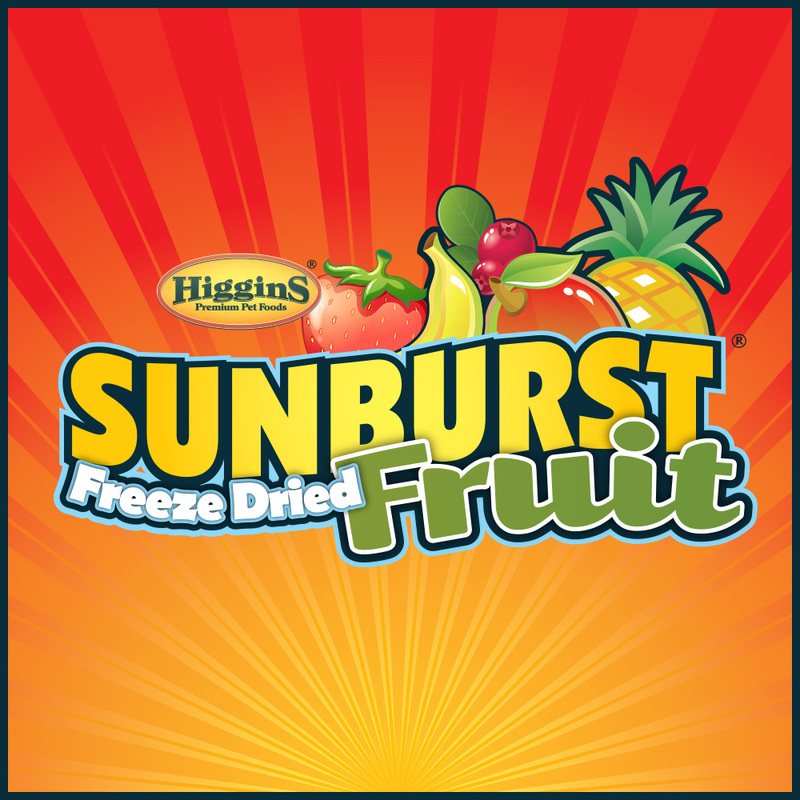 Fruits are harvested and freeze dried at optimal ripeness to capture the best, natural flavors. Great for Conures, Lovebirds, Eclectus, Parrots, Cockatoos and Macaws! Higgins Sunburst® Gourmet Treat Sticks are the treat feasts with more natural goodies your pet bird craves. Sunburst® Gourmet Treat Sticks are free of artificial colors and preservatives and are an entertaining, delicious treat for your feathered friend. Available in flavors for all sizes of birds. Mineral Grit for all small birds including Canaries, Finches, and Parakeets, is a great source of calcium and minerals. Mineral Grit is made with crushed oyster shells and not gravel. The oyster shells are enriched with essential minerals that give its unique color and natural anise oil for a pleasing, licorice aroma. Higgins® Protein Egg Food provides your birds with an excellent source of protein derived from both animal and plant sources. Companion bird foods that do not contain animal proteins can be deficient in the necessary amino acids, methionine and lysine. Protein Egg Food is all natural (with added vitamins and minerals) and made with baked whole eggs, whole grain bread crumbs and pure honey. Higgins® Protein Egg Food also supplements your bird’s dietary intake with Vitamin A for immunity, Vitamins B12 & E for cell development, Vitamin D for bone and muscular development and Biotin for improved feathering. Protein Egg Food is also enriched with plant-based, balanced DHA omega-3 and 6 fatty acids to promote overall health. Higgins® Protein Red Egg Food has added Beta-Carotene to assist in maintaining your red factor canary’s unique color. Explore Our Entire Line Of Premium Diets For Birds.